You must make reservations at least 5 minutes in advance of the time at Rio Brazilian Steakhouse. Brazilian regional dancers on the weekend. We offer a wide selection of menus and services to entretain any function. 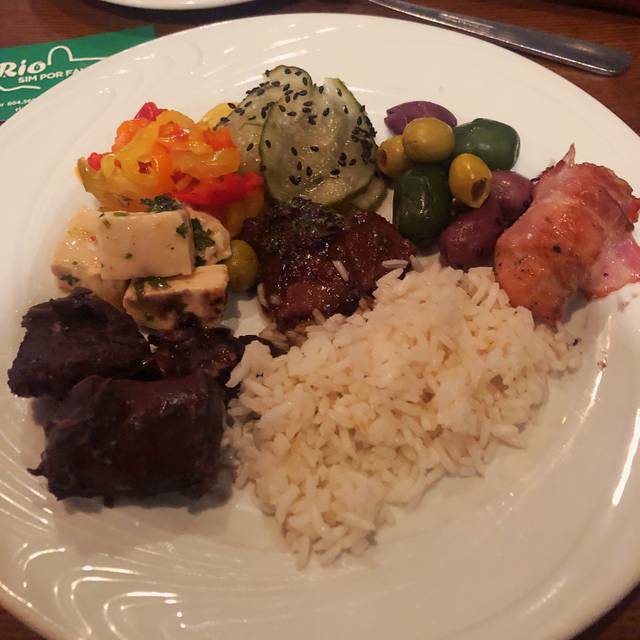 Rio Brazilian Steakhouse offers a continuous table side service (rodizio) with a large variety of delightful cuts of Beef, Lamb, Chicken, Pork, Fish, among other exquisite selections. At your table you will receive complimentary `Pão de Queijo` (Brazilian cheese bread) and Deep fried Banana to accompany your choices and taste. Available for your pleasure also is our incredible fresh and modern salad bar and hot buffet with daily chef creations that you are welcome to serve yourself as much as you please. Guests control the flow of meats just by using the double sided card provided at your table. Green means Yes! More meat, while Red means No, I"ve had enough. When you are ready for more, just flip it back to green and our servers will be happy to serve you more. A selection of traditional Brazilian desserts are also available to complete your experience at Rio. Lunch is served from 11:30am - 3:30pm, Monday to Friday and 12:00 - 4:00pm on Saturday/Sunday. Dinner is served from 5:30pm - 10:00pm Sunday to Thursday and 5:30pm - 11:00pm Friday and Saturday. It was good, but we arrived at 5:30, they were opening so they didn't have a lot of things ready. It was dinner but no bbq ribs yet not pão de queijo until the very end (almost 7 pm). We'll give it a second chance but arriving a little bit later. Suggestion to the restaurant: if you open at a certain hour, try to have everything ready or open later. Overall this a great place for larger groups! The meat is not self-served, as staff bring around various types of meat throughout the night but felt the pace of serving was sufficient. We had a good time. We enjoyed the food, drinks were good as well. The overall experience was not that good. For the price charged the food offered is not good enough. It was our first time here. We thoroughly enjoy the food and the entertainment. Great service and amazing food. Not so much the salad bar, but the meat quality,taste, and variety was great. Delicious meats, music was a bit too loud during dances but was welcome with the live entertainment. Our server had trouble remembering requests for water and unnecessarily took away a place setting for someone who was late. Would definitely want to come again but $40 is steep. A fun experience. Bring your appetite and leave the vegetarians home. It's a nice place. The meats the offer are not a big deal but the salad bar and the ambience is great! 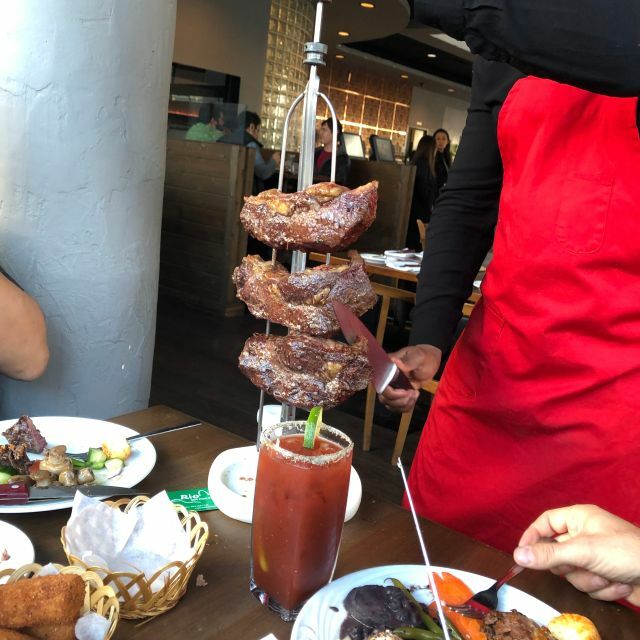 The meat was too little and there were times that servers skip our table. Salad bar was not first rate. Food was extremely poor. Steaks were too salty. Meats like Lamb took forever to come. AMAZING!!! Food was so good! We celebrated my husband's 45th Birthday with our kids and the environment was great, clean, and kid friendly! A great experience is the best way to describe Rio, it's more then a restaurant and more then all you can eat. Dinner and a show with very friendly and professional staff. We found the gaps between meat service to be very long, not enough meat selection and the salad bar items didn’t taste good, neither did the meat actually. Was quite disappointing for the amount of money we paid. Won’t be returning or referring to anyone. The servers themselves were lovely though. The salad bar was just horrible, salads were soggy and not fresh! Meat was in poor quality. I’ll never go back there!! Everything was great except our waitress. Don't know her name, but she's not new because we've seen her working there the other time we've gone. I had a table of 10 and when ordering, she'd only listen to two people max and run off while there's obviously others who also want to order - that happened everytime we wanted something and she acted like she didn't want to waitress. It was like because we're a big group and tip was already included in our bills, she didn't feel the need to do her job. Being a waitress myself, that was really bad service. I'm happy everything else was great. We had fun, just would've been even better. Thought this would be nice to try. Boy was I wrong. Server was nice. Salad bar was soggy. they kept running out of meat by the time they would get to our table then start again at the beginning. only 4 choices of meat then repeat. Left hungry and grabbed a burger down at Fatburger. Horribly overpriced. None of the most advertised on their website was being served. Save your money and go somewhere else. Good salads, ok cocktails. Service is great and friendly. Pricy but for the experience and style is ok. Some cut abit too salty, other are great. Had my birthday here! Great selection of food! We had a lot of fun due to the service and the samba dancers, but the food was low quality. The buffet was limited and not very appetizing. And we were really disappointed with the quality of the meat. They were all very fatty and greasy, and the meat was not well seasoned. 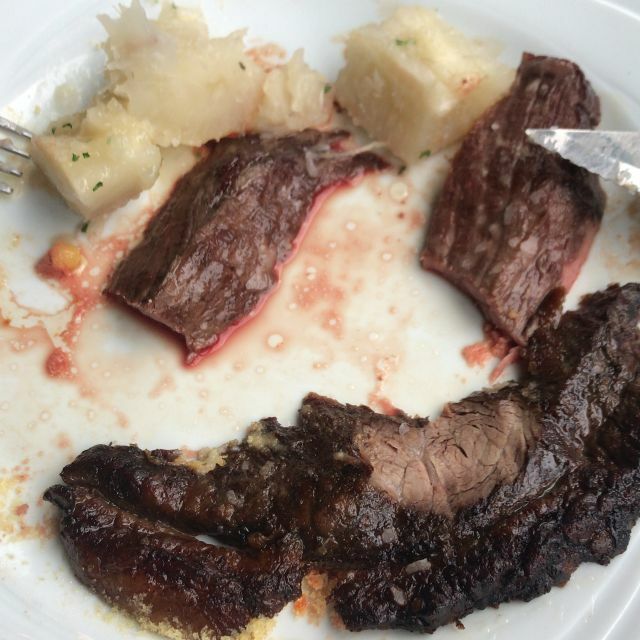 I generally like my steak medium rare to rare, but most of the meat was more blue rare. Still almost raw in the center. 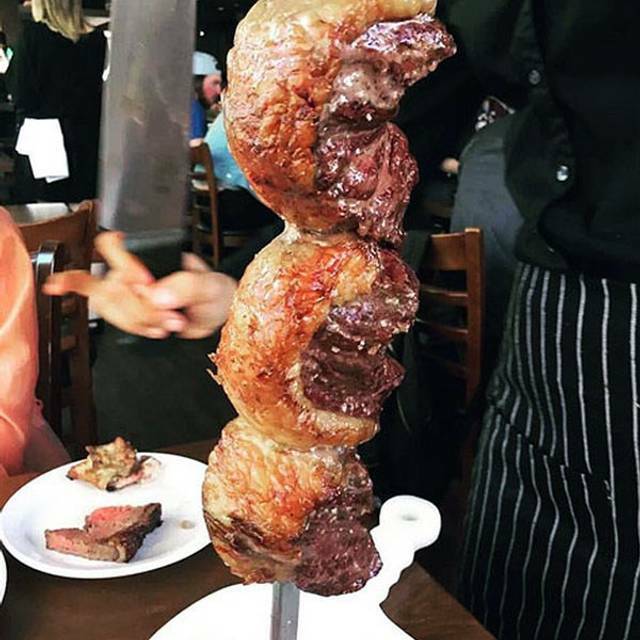 There were only two cuts of meat that we enjoyed and they each only came around once. The service was very good though. Our waiter was prompt and attentive, and had a great personality. There was a waitress that also checked on us from time to time, and she too was very pleasant and helpful. They were quick to clear away old plates and make sure you had everything you needed. The restaurant has a Samba show on the weekends, and this added a lot of fun to the evening. The manager came around to all the tables to check on everything, which was nice. My only complaint with it was that he touched my shoulder and lingered an inappropriate amount of time. It was a bit sleazy and not really appropriate, as he hadn’t built any sort of rapport with us before doing this. Although we had a fun evening, we likely would not return due to the quality of the food. Please note: access by 2 sets of stairs so not appropriate for people with disabilities. The variety of meats was great, we got offered about 12 different styles and they all came back around multiple times. They even had cinnamon BBQ pineapple! Food was always hot, service was very friendly, salad bar was fully stocked. We ate at 6pm on Friday, and the place was just filling up as we were leaving around 7:30. Nice wine list, and on wine nights the bottles are 20% off! I enjoyed the food, but there was an unruly drunk person at the table beside us harassing kids. 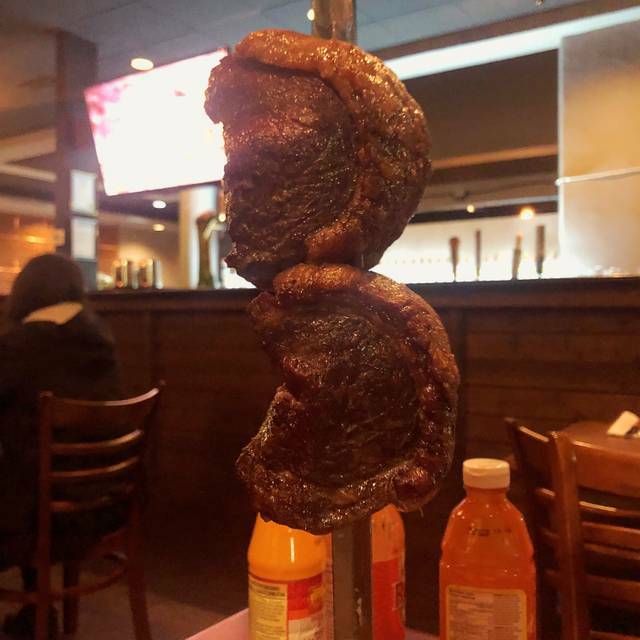 We took our Brazilian homestay daughter for a farewell supper before she returned to Brazil, and she raved that it was a total authentic Brazilian food experience. The offerings of different meats were incredible and the salad bar was superb. Staff were incredibly fun loving and friendly. Highly recommend! So good! Amazing staff and the food is out of this world!!! Food is good, though they keep the good cuts of meat until later in the evening. Super loud, we couldn’t hear each other speak, which was irritating. The cost doesn’t justify the food, unless you’re someone capable of consuming huge amounts. I’ve lived in Brazil, and this place would be pretty cheap there... and the salad bar would be massively better. 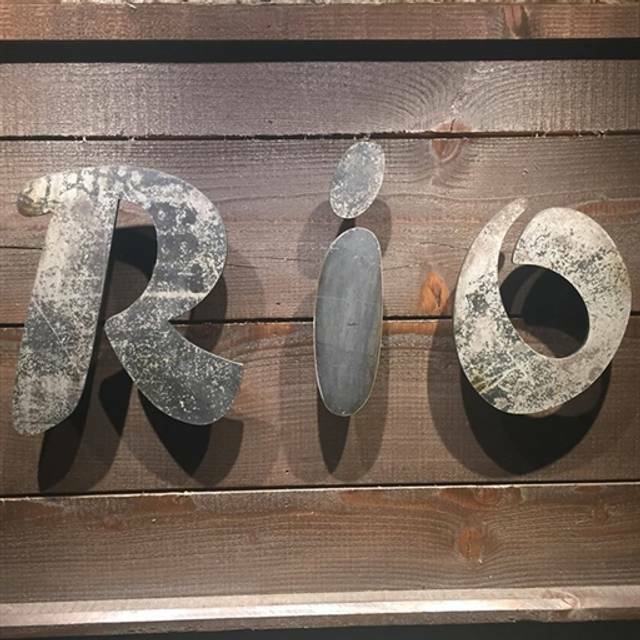 It was a great experience dining at Rio, very accessible in downtown Vancouver! Friendly and accommodating staff! Enjoyed different variety of meats! Will definitely recommend this restaurant! The food was quite mediocre compared to the price per person, and the servings of the meat was tiny!! The salads were the only good part of this experience, and paying $33 for just salad is ridiculous. 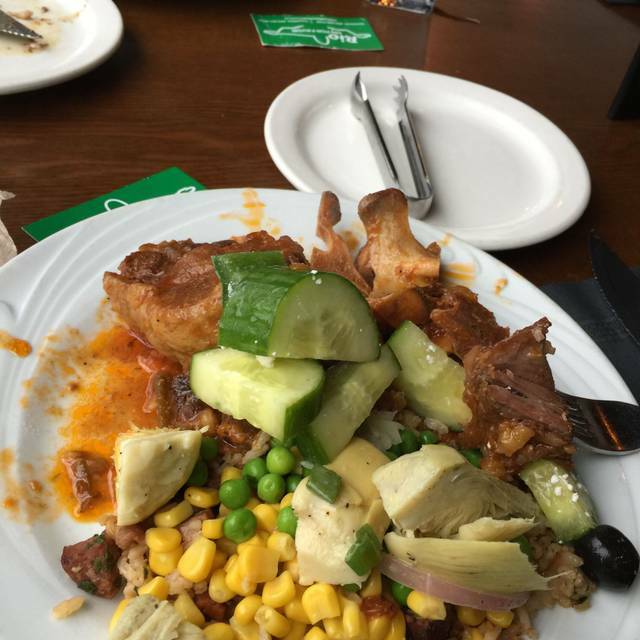 The “side” dishes were just rice and some fish. Nothing was labeled, which is not only inconvenient but not also not safe, because I am allergic to seafood (not extremely) and one of the salads had fish in it. The customer service was very poor, and the four of use left the restaurant very upset, and also hungry. Do not recommend for anyone. Meat is always good. I just wish the server was more courteous to check on us every so often. We were always out of water and server didn’t check if we needed anything else. I had to ask numerous times for certain things. Aside from that everything else was okay. We had a great time! Couple families with kids went out for a fun time and Rio did not disappoint. There was something for everyone to eat and everyone had a great time. Fun to watch the dancers too! Will be back. The meal servers are very friendly. He brought us the pineapple when we requested it eventhough he’s still serving the steak. Disappointed return after many good meals in the past. Selection of BBQ reduced and what came out wasn’t great. Many undercooked and cold items. Seemed the kitchen was holding back on what was a slow night. Honestly, the service was really good however the food was quite poor. The meat was always dry and either under-seasoned or heavily over-seasoned. Seriously a disappointment there. Furthermore, I was actually served raw fish, and when I notified the server, she did nothing about it - only told the manager about it. The raw fish was left on my table alongside with the fork I used to poke at it, I don't think it is too much to expect the server to replace these for me. Most restaurants will compensate you with a free meal especially when you are being served something raw, but I guess that was too much to expect. Most of the meats were dry. They seemed short staffed and underpaid. Food was great, lots of options, really tasty buffet bar with a wide selection of items. Some of the meats served on that day we visited was slightly cold/too raw. We came for their date night deal $60 for 2 people. Service was amazing, the food came out quickly and quite a large variety. I did find the food got quite a bit saltier as the night progressed. I’m assuming it was because they seasoned it with salt again before putting the meat back in to grill.